We have experience laying products such as Natural Stone, Block Paving, Resin Bound and even external Porcelain. Depending on the material used depends on what type of base we use but we will never ‘take a risk’ with the bases, we’d prefer it to be strong enough then to take the risk. We believe in using quality bases for a quality long lasting product. Once again the excavation and sub-bases are the most important factors in building a Patio. If the excavation/sub-base is too shallow then the outcome can look good but will only last for a short period of time. Here at Boxer Building and Landscaping, we don’t use cheaper alternatives in our sub-bases such as road plainings or recycled materials. 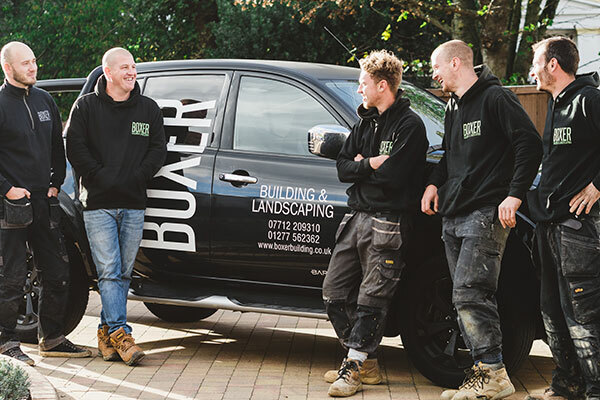 All of our patios are built using quality products. . We will meet you to discuss your plans and advise of any issues that may arise and the best way to work around them or support them.